(1) The number of U.S. operations against al-Qa’ida in the Arabian Peninsula (AQAP) has drastically increased under the Trump administration. The U.S. has established its primary base of operations in the city-port of Mukalla (Southern Yemen), which was liberated from AQAP by the United Arab Emirates (UAE) and its local allies. The cooperation with the UAE enables the CIA and the Joint Special Operations Forces Command (JSOC) to target AQAP’s strongest cells in Yemen. (2) Southern and Central Yemen are important recruitment and training grounds for AQAP. The rough, remote and hostile terrain provides sanctuary for high-value targets (HVTs) that have planned and continue to plan major attacks on American citizens and the U.S. homeland. (3) AQAP’s power in Southern and Central Yemen has increased considerably during the Yemeni Civil War. The central government’s collapse allowed AQAP to establish large urban strongholds. AQAP dominates the Hadramawt, Mahrah and Shabwa provinces, and exerts significant control in Abyan and Bayda. AQAP cells have conducted attacks in major cities such as Aden, Hudayah and Sana’a. AQAP is currently estimated to have between 6,000 and 7,000 active fighters in Yemen. (4) In 2015, AQAP seized control of Mukalla (Hadramawt province), proclaiming it the capital of the Yemeni “wilayat.” As Mukalla is Yemen’s second largest city-port on the Southern seaboard after Aden, the city became an important revenue and recruitment source for AQAP. (5) In mid 2016, AQAP was ousted from Mukalla by the UAE and an allied coalition of local tribesmen and secessionist militias that later formed the Southern Transnational Council (STC). The ground offensive was backed by limited U.S. Special Operations Forces (SOF) elements as well as by U.S. airborne and maritime intelligence support. The UAE claims that it has neutralized over 500 AQAP militants, however, media sources suggest that the Emiratis also bribed a number of jihadists to withdraw from the area. (6) In 2017, the new U.S. Presidential administration authorized the Department of Defense (DoD) and the CIA’s Special Activities Division (SAD) to accelerate and expand operations against AQAP. Mukalla, now under UAE/STC control, has become America’s largest covert forward operating base (FOB) in Yemen. (7) The SOFs deployed in Mukalla are drawn from all JSOC special mission units, but mostly the Naval Special Warfare Development Group (known as DEVGRU or Navy SEAL Team Six). The SOFs get airlifted from the U.S. 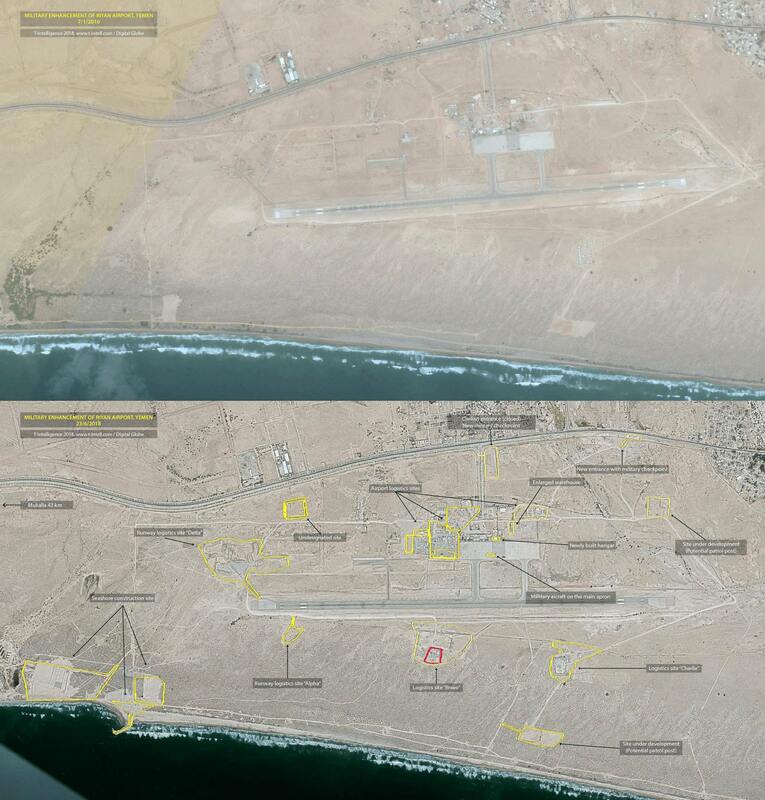 Naval Expeditionary Base “Camp Lemonnier” in Djibouti to Riyan Airport in Mukalla. Camp Lemonnier is a hub for special operations in the Horn of Africa area and the most important launching pad for drone/unmanned aerial vehicle (UAV) strikes outside of Afghanistan. 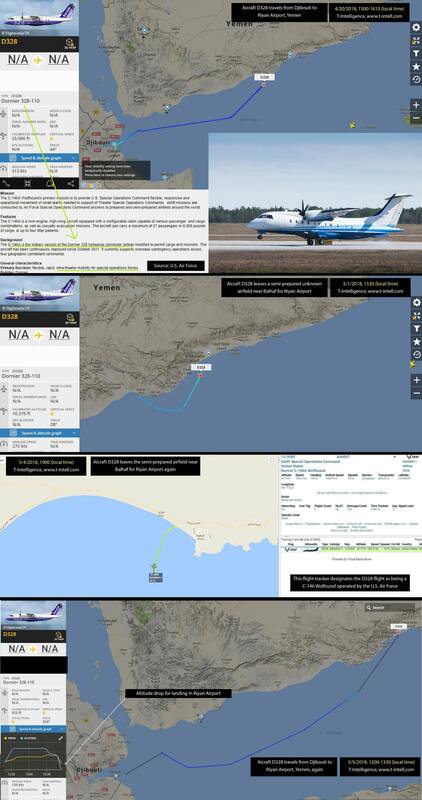 (8) Flight traffic monitors show undesignated Dornier 328-110 turboprop commuter aircrafts departing Camp Lemonnier and “disappearing” over Mukalla after descending for landing. The Dornier 328 is the civilian version of the C-146A Wolfhound – the primary SOF air asset used to airlift fireteams or small cargo loads into semi-prepared airfields. JSOC is known to use the civilian version of the Wolfhound for SOF deployment in order to maintain operations security (OPSEC) standards. (9) Image Intelligence (IMINT) based on commercial satellite imagery furthermore reveals a significant military expansion of Riyan Airport since it was liberated from AQAP. UAE/STC forces have built or considerably expanded at least 10 sites in vicinity to the runway, including observation posts, warehouses, fortified sites, patrol routes, a small seashore construction, and a number of unidentified buildings. A militarized checkpoint replaces the civilian airport entrance, which was closed in mid 2016. The main apron hosts military attack and transport helicopters, which can be used to forward deploy SOFs into combat areas. (8) Reports also suggest that a covert detention and interrogation center – run by local authorities and exploited by the UAE and U.S. for intelligence collection – has been established on the grounds of Riyan Airport. We assess that all of the airport enhancements serve military purposes. In 2018, enlargement and enhancement efforts continue. (9) The mission profile of JSOC SOFs deployed in Yemen is to conduct reconnaissance, intelligence gathering and HVT-execution, including support for kinetic UAV strikes. They frequently liaise and coordinate with Emirati commandos and enlist the help of local STC-aligned tribesmen and militias. (10) The Kingdom of Saudi Arabia (KSA) also assists the U.S. counter-terrorism effort. The KSA commands a network of human intelligence assets that has infiltrated AQAP’s ranks. These assets provide critical intelligence and plant signal beacons on HVTs for UAV targeting missions. AQAP is trying combat the KSA-infiltration through strict counterintelligence measures, as announced in a propaganda video issued in early September 2018. (11) The unprecedented surge in SOF missions has produced valuable intelligence and eliminated several AQAP HVTs in Yemen. According to CENTCOM datasets assessed by The Long War Journal, the U.S. conducted 125 UAV kinetic strikes in 2017 – more than in the previous four years combined. With 33 strikes by September 2018, the U.S. is again on track to surpass the pre-2017 years. The SOF/UAV strikes have targeted AQAP training camps, checkpoints, safe-houses, and tactical positions in Abuan, Bayda, Mahraw, Shabwa and Northern Hadramawt – Northern Hadramawt hereby received the largest share of attention. (12) A U.S. UAV strike in the second half of 2017 reportedly killed Ibrahim Hassan Tali al-Asiri, AQAPs most talented bombmaker. Al-Asiri was known for disguising bombs as printer cartridges, cell phones, and other devices or planting them in human bodies to bypass airport security. The UAE played a major role in the target-acquisition process, as Emirati commandos captured al-Asiri’s wife for interrogation. Al-Asiri’s death represents a crucial blow for AQAP’s capabilities. (13) At the moment, the primary target of U.S. SOF/UAV operations in Yemen is AQAP emir Qasim al-Raymi, who is closely associated with Ayman al-Zawahiri, AQ’s top commander. In the past eight years, al-Raymi was unsuccessfully targeted by the U.S. at least three times. The last attempt took place in 2017, when a controversial DEVGRU-led raid on al-Raymi’s safe house in Yalka (Bayda province) failed to kill the target. (14) It is highly likely that U.S. SOF/UAV operations in Yemen will intensify in the next years. The U.S. Transportation Command (USTRANSCOM) is currently looking to contract private operators for airborne casualty evacuation (CASEVAC) and medical evacuation (MEDEVAC) in Yemen and the Horn of Africa area. According to the draft performance work statement published online, the Special Operations Command Center will be the beneficiary of these services. The call specifies that the private contractors have to be able to operate fixed-wing and rotary-wing aircraft on unprepared runways as small as 900 m, use night-vision goggles, carry no less than eight men or almost 2 tons of cargo, and refuel with running engines. Aircrafts need to be armored with lightweight, Level III (7.62 mm and 5.56 mm) Ballistic Protection Systems. (15) The details of this commercial listing suggest a sustained expansion of the current SOF activities in and around Yemen. We asses that U.S. SOFs have moved further in AQAP-held territory and are building/planning to build FOBs with coaxial dirt runways to receive supplies and evacuate personnel. As these FOB postings are highly dangerous, the SOFs require MEDEVAC/CASEVAC assets that are available 24/7 and can work under heavy enemy fire. DISCLAIMER: Some IMINT materials have been excluded from the analysis in order to safeguard U.S. OPSEC, as SOF missions in Yemen are ongoing.